It has been a very gloomy, wet week here at Casa Tuxedo Cats Are Bewildered by rain. We have six perplexed felines, a dog who hates to get wet and one teenager who is down with the mother of all respiratory infections. Is it any wonder that I am craving a bit of color and sun? Oooh thank you! I love what they remind you of. 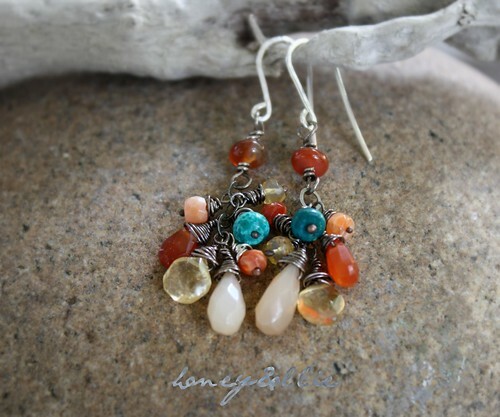 They’re Mexican fire opals, carnelian, citrine, peach moonstone and turquoise… they kinda remind me of vintage Fiestaware colors. I love these – beautiful! The color is beautiful, it feels like Santa Fe. Hope the teenager is feeling better today.